Mathematical demography is the subfield of demography that is concerned with developing and refining measures and methods for studying population composition and change. Historically, demographers used population level data to compute measures of the key components of population change: fertility, mortality, and migration. However, the field has expanded considerably over the last half century to include predictors and consequences of demographic change. Sample data is now commonly used by demographers, and statistical methods are commonly used in conjunction with mathematical methods. In this chapter, we define key mathematical concepts that form the basis for historical and contemporary demographic analyses, including the population balancing equation and rates. We discuss the single decrement life table and its extensions to multiple decrements and multiple living states. Next, we discuss the stationary population theory that underlies life table computations and show its extension to stable and nonstable populations. Finally, we discuss several topics of contemporary concern, including population momentum, household projection methods, quantum and tempo adjustments, and methods for cohort analysis. Feng, Q., J. W. Yeung, Z. Wang, & Y. Zeng. (2018). Age of retirement and human capital in an aging China, 2015–2050. 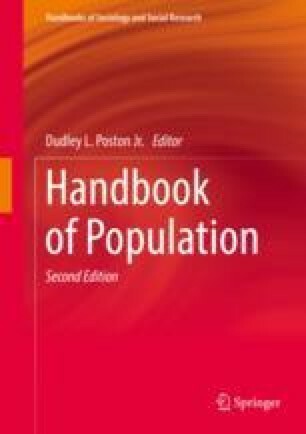 European Journal of Population doi: https://doi.org/10.1007/s10680-018-9467-3.